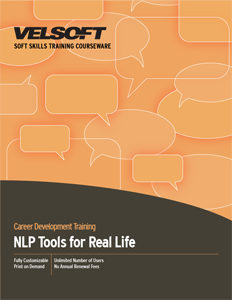 This training courseware title provides everything you need to professionally deliver NLP Tools For Real Life training including editable training manual, hands-on exercises, exercise files, detailed instructor guide, classroom-ready PowerPoint slides, and unlimited online learning licensing. Seeing is Believing This sample manual to teach NLP Tools For Real Life is in MS Word format. Do you have participants who know the basics of neuro linguistic programming, but who want more training with NLP? Velsoft's NLP training material has been designed for participants equipped with the core principles of NLP techniques and want to learn more about the tools they have and how to use them to greater effect. NLP Tools for Real Life provides participants with hands-on experience with important NLP techniques, including anchoring, establishing inner congruency, developing rapport, creating goals and outcomes, interpreting and presenting information, and some self-hypnosis techniques. Velsoft's training material is fully customizable for trainers, and includes an instructor guide, pre- and post-course assessments, and a personal action plan for students so they can immediately put their NLP training to work for them. Velsoft's NLP courses include access to the eLearning website, giving instructors the opportunity to augment their classroom-led training with interactive technology in a blended learning environment to get the most out of their material.